What Will Your Learning Space Look Like in 2018? What our learning spaces will look like — and how they will function — in 2018. 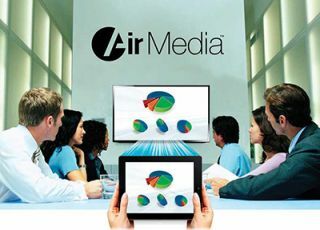 Crestron AirMedia supports HD wireless presentation.and collaboration — two major design trends in higher education. The building blocks for the future of learning space design are already around us. Exploring five key areas will highlight the challenges our industry must overcome to make that future a reality. But first, one must understand the overarching educational trend that is driving the process: the collaborative classroom. The pedagogical push into collaborative learning seems new to some, but in practice it has been around for a very long time — it is just being rebranded and marketed. This teaching style is an expanded application of what has been used in engineering, design, and business schools for years. In short, the class is a collaborative self-guided process, which is typically based on a short lecture at the start of the session or the review of a homework assignment. After the initial discussion, the class is run like any other laboratory class. Instead of the instructor lecturing for 80% of the time and interacting with the students the other 20% of the time, student teams spend 80% of the time in group learning while the instructor moves between the teams, providing personal guidance and responding to questions. This “flip” in the process required a “flip” in design. This collaborative environment can be a great source of revenue for the AV industry, but also presents design and management challenges. Designs for dynamic, versatile learning spaces that are equipped for self-guided learning, group workshopping, and constructive idea-exchange. Courtesy of Thorburn Associates. but many instructors still prefer to be near the front. While a front of room focus is clearly not important when students are working in groups, it is still important for the 20% lecture. Having students twist their bodies to turn to see the instructor resembles a game of twister in the classroom. Our experience shows that U-shaped tables all facing a central point are a very functional solution for collaborative group work seating that aligns with a unidirectional view to the front or center of the room. What about the technology? This is where it can get real expensive…really quickly. Our studies have shown that a projection system is not always the best solution for this type of room. Projecting images for six to eight tables of students plus a main room display can be very costly. We feel that the displayed image should be a flat panel display no larger than 50 inches and no smaller than 40 inches. The display should be mounted at the end of the table but down low so students can see it but also view the instructor when they are in the front. The room display should still be a projected image, but it can be smaller and off the “center line” of the room, because the same information for critical viewing would be at the student tables. We still keep the primary image up in the front to support the 20% lecture component. To make sure that everybody is seeing the same thing, the resolution of the projected image should match that of the displays at the student tables. In four short years, sales of iPads and other tablet devices sales have outpaced laptops, with some researchers showing that mobile devices will exceed all computer sales next year. All the portability, flexibility and accessibility they offer is good if you are on the public network at Starbucks or with your wireless provider, however, as soon as you step foot on the campus or the office, BYOD becomes a network access and security issue. Five years ago when students came to school they might have had one computer to register on the network. Now it is a computer, a tablet, a smart phone, a wireless printer, and more. All of these require security controls and all require bandwidth. In our experience, some IT staff are more forward-thinking than others in planning for the challenges the onslaught of mobile devices brings. BYOD is a trend that does not appear to be slowing down, and as students and instructors come to rely on their own devices, they will demand that they work effectively in the classroom as well. Once network access and security issues are resolved, the main challenge in BYOD leads into the next area of development: sharing content wirelessly. 1) WHDI (Wireless Home Digital Interface) — a consumer electronic specification for wireless HDTV connectivity throughout the home. There are many more options with their own entire feature set. Once a standard is uniformly adopted, the limitations of using a tablet as the primary teaching resource will disappear. President Obama seeks five million more graduates from community colleges by 2020. For this to happen, Obama stated that he intends to invest a total of $12 billion over the next 10 years. Known as the American Graduation Initiative, the plan puts aside $9 billion to devise new grants for schools to develop new programs and to expand job training/counseling. His hope is that these programs will boost learning for college students and lead to higher completion rates for the schools. The plan also puts aside $2.5 billion to renovate facilities at college campuses. One way to quickly accomplish this is to utilize a virtual college. This form is a challenge to the bricks and mortar educational institutional. In the future, you will be able to select the courses that meet your educational goals and shop for your credits from any combination of colleges you would like. The term Massive Open Online Course (MOOC) has been coined to help discuss this. Most MOOC are free, but right now the completion rate is very low. What is missing is the overall agency that approves the content, credits, and cubby-hole that it fits into. Once we have that, there would be no limit to the number of students that could take a class, the cost per credit hour would be leveled from provider to provider, providing a way to get an education while reducing student debt. For the AV Industry, this will require technical spaces, new and simple lecture capture rooms for the subject matter experts to present from and, naturally, the connectivity to broadcast the content. The “flip” in the pedagocial process requires a “flip” in learning space design. This collaborative environment can be a great source of revenue for the audiovisual industry, but also presents some design and management challenges. Just as I dream about wireless video that works, I also dream about a much simpler installation and commissioning process, one that lets us test the cables with a simple meter, and allows the designer to quickly download the routing, setting and any presets in just a few minutes. That requires an open standard not a manufacturer’s standard. AVB is just that. Shortly, we will be sending our video signals over our computer networks, the switches will know when to mix, split and distribute the signal based on that initial programming. Dante is a form of AVB that has been adopted by much of the pro audio industry. The Dante team states they function on a sub set of the AVB standard and are AVB compatible when AVB finally comes around. Officially AVB, is a suite of open standards IEEE 802.1 series designed specifically for the time synchronized delivery of audio and video media through networks developed with the support of the Institute of Electrical and Electronics Engineers (IEEE). To really understand the benefit — and importance — of AVB we need to look at what happens with current Ethernet networks and AV media. On current IT networks, there is no concept of “time;” there is nothing in the network infrastructure itself that synchronizes when information is needed. For computer data this is fine, the packets can show up when they want to. The computer will store the data and present it once it is all there. For audio and video communication, pauses are important — did the person lose their train of thought or was it the delivery system? With multiple sources and destinations for AV media, it is critical that there is some type of common time clock to which all of the media is synced. For AVB to work, new switches that open up the path between the nodes are required. Extreme Networks is one of the first manufacturers stepping up and building an AVB network switch from the ground up. These are the building blocks for the classroom of the future, already available, but still needing development. Within these challenges lie opportunity, and it is up to our industry to help turn hopes for the future into reality. Steve(n) Thorburn, PE, LEED AP, CTSD, CTS-I is the Design Principal of Thorburn Associates Inc. Thorburn Associates is an acoustical consulting, technology system engineering and lighting design firm, with offices in San Francisco, Los Angeles, Orlando, Charlotte, and Raleigh Durham areas. He can be reached by email at Steve@TA-Inc.com, or by phone at 510.886.7826. An earlier version of this article ran in a 2014 AV Technology edition.